Games come out daily, if not hourly for the iPhone and iPod Touch. Most of the time these titles are awful and money sinks, even at 99 cent or free. 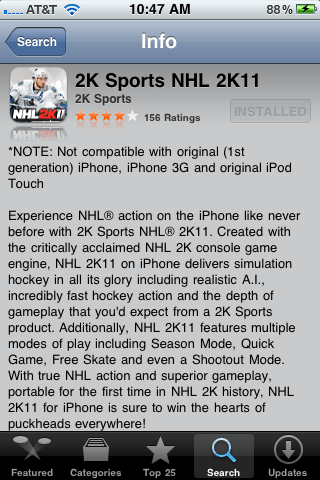 Yesterday NHL2K11 came out for Apple’s handhelds. Before I start reviewing the title, I have to give everyone a heads up that this game has a whole host of hardware restrictions. Now this might be because of the higher end graphics, however I think it has to have with IOS 4.0 support. It only works on the iPhone 3gS, iPhone 4, or iPod Touch 2nd Gen devices. Although they phrase it weird in the description. Multi-tasking seems to be the major reason for this as it is the heart of playing a whole game without issue. You can pop in and out of a game on the fly. This is huge on a mobile device so you can use it on the fly and swap back and forth in between talking on the phone and checking e-mail. There is never a break in the action while doing this. However over my 5 game experience over the last 10 hours or so, I did experience a few crashes. Now these crashes did restart the application from the start with no in-progress game save. This is a full fledge hockey game. It is comparable to one on the original XBOX or PS2. 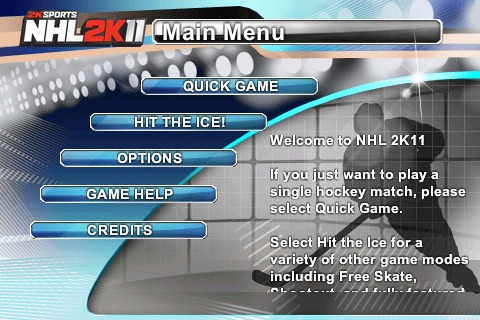 It has a good selection of modes, including Quick Game, Season, Free Skate (practice), and Shoot out. Season mode is full-featured, including salary cap, trading, 41 or 82 game seasons, playoff series length, etc. 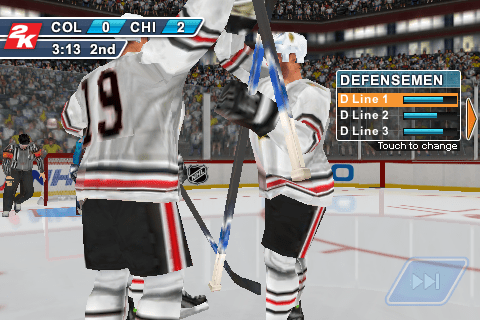 It is huge and extremely robust, especially for a mobile version of hockey. 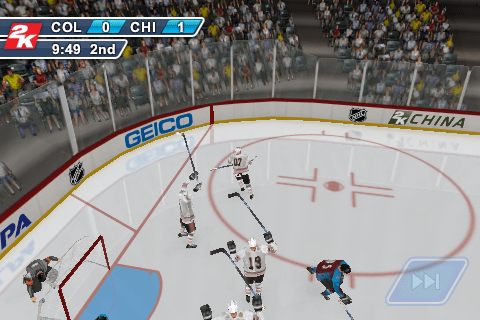 NHL2K11 does suffer from many of the common control problems that most mobile games to have. The control can sometimes be laggy, non-responsive, or just not have as precise control as one would wish during a hockey game. There are only 3 buttons and a controls stick when on defense or offense. On offense, the buttons are pass, shoot, and turbo. On defense, the buttons are change player, check and turbo. The action is fast as you would expect in a hockey game. 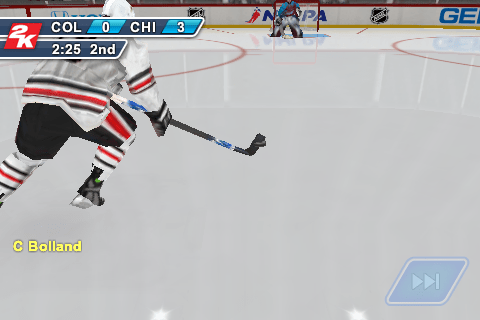 You can move up and down the ice with ease. When you see that open player and want to execute that one timer, it happens, sometime not how you want, but it is there. The game looks great too. There are lots of camera options. You can go from on the ice to up high, with a whole host of zoom levels. I find 3/4 Simple with Large zoom to be the perfect fit. Of course the models are rather large polygon based characters, however this stands up under the small player area of the iPod. The only time this is very noticeable is when there is a close-up, generally after a goal or penalty. As you can see, it looks good and offers plenty of variety. You might be able to see a few limitations of the game in these screenshots though. For a game labeled 2K11 the rosters are completely out of date. Versteeg has not been a Blackhawk since shortly after the season ended. Brian Campbell wears number 51, not 07. It seems that unless you are you are a super star, or win a gold medal, you are accurate in name only. This is really the only place the game falters. Which on the grand scale of things is not a very big complaint. Although the roster maybe slightly out of date the ability to juggle and handle line-changes is a nice touch. Makes it feel less arcade and more simulation. Robust line-ups and features. You can play anything from arcade to simulation if you want. Fairly reliable controls for a touch screen game. Occasional crashes that can reset where ever you were at in a game. Players can sometimes go where you don’t want them to. Thumb controls can obscure portions of the screen when skating up the board. 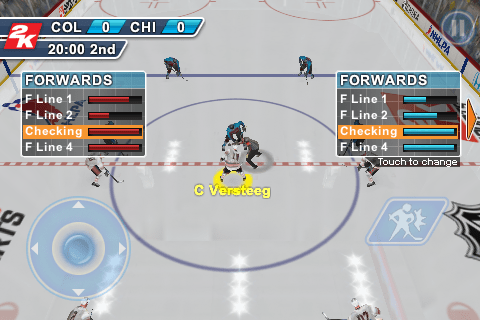 All in all for a $1.99 title, this is a really full featured portable hockey game. Games of this quality and this price point can easily show why portable gaming is no longer limited to a DS or PSP. You can get this quality of a game for less then $5 bucks. This clearly is showing the dominance that the iPod/iPhone product line can have in the portable gaming market. 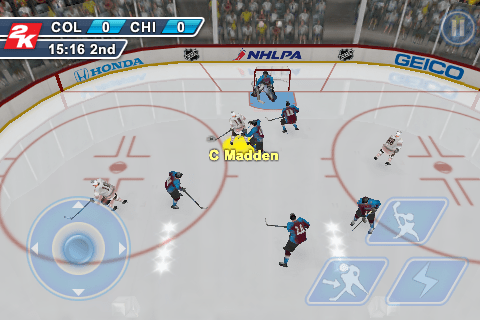 Will NHL2k11 for the PC have a create-a-player mode? I do not know, I believe it does. 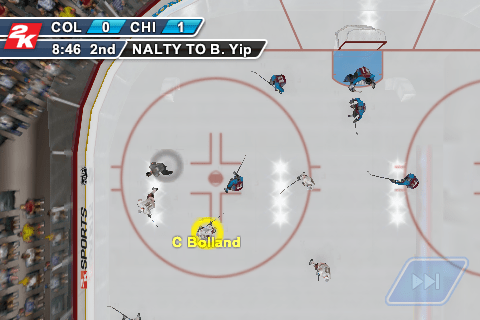 I am a NHL 11 fan. 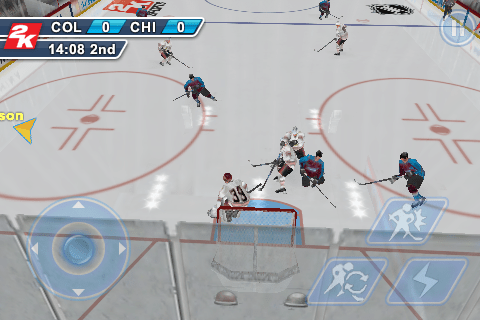 I reviewed 2K11 because it is one of the only mobile choices for hockey.